BELLA - Taste the Beauty! : When You LOVE it... Write About It!! When You LOVE it... Write About It!! I had a call back from a customer last week that claimed he'd found the "dream deal" for his passion of BBQ on his recent visit to BELLA. I asked if he'd be willing to write a review! catalog this year. But I'll let David tell you more!!! As a life long barbequing practitioner I have always been frustrated when trying to grill fresh vegetables on a barbeque. Fine screen grill attachments I have purchased in the past were poorly constructed, wimpy, and usually failed in a short period of time. I even tried using paint roller screens designed to hook onto a painting ladder. Unfortunately the results were unsatisfying and the ladder hooks made the process clumsy to say the least. And, lots of beautiful veggies were sacrificed during this unsuccessful experimentation, ending up in the bottom of the barbeque along with the charcoal. 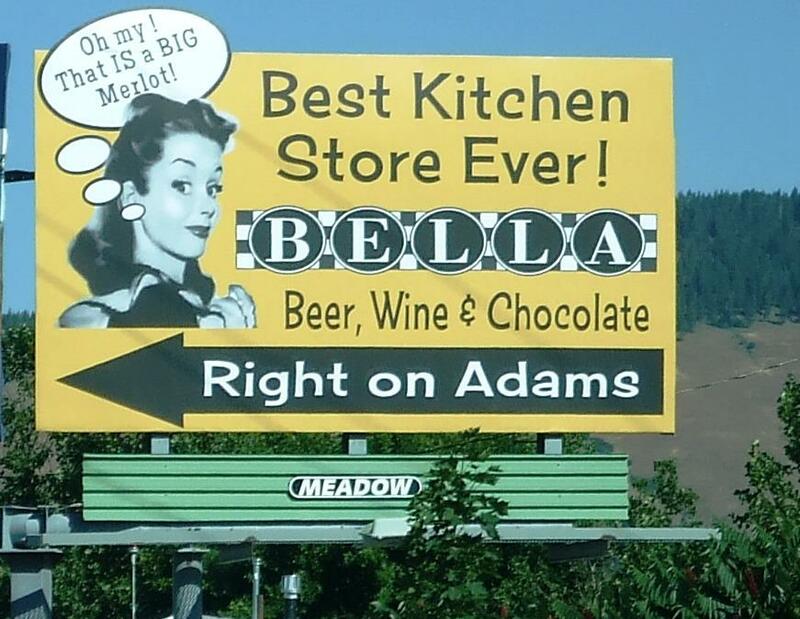 Finally, due to the buying genius of Beverly Calder and her extremely competent staff the miracle product showed up on the shelves of the wonderful BELLA Main Street Market in beautiful downtown Baker City, Oregon. Unbeknown to me, the Kingsford charcoal briquette people started marketing a fantastic BBQ wok. Carefully thought out, perfectly engineered, and extremely sturdy, this is the ultimate veggie griller for use on an outdoor barbeque. And it even has handles for lifting it onto and off the grill. Take a mixing bowl and fill it with various vegetables you have selected from your garden or the local purveyor. Before the veggies go into the bowl chop them up in one inch lengths. (Cut at a forty-five degree angle for artistic effect if you like.) Various squashes, onions, peppers, eggplant and anything else you can think of work great. Roma tomatoes are particularly delicious and juicy and grill perfectly. I love to add several jalapeños sliced length-wise with the seeds left in. (This adds a delicious heat to all the vegetables that are being grilled.) When your bowl is filled to your satisfaction drizzle a little olive oil over the mixture and add some high quality garlic salt. Stir things up and you are ready for the grill. Take your new BBQ wok and spray it with Pam or just brush on some of the olive oil you used for the veggies. Place the empty and oiled BBQ wok onto the barbeque grill and wait until it is good and hot. Dump your prepared vegetables into the wok and stir with a soft (Teflon) spatula while you drink a delicious glass of excellent wine from the BELLA inventory. When the veggies are cooked and nicely browned, remove the wok from the barbeque using two pot holders and dump the contents back into your kitchen bowl that still contains olive oil and garlic salt residue from the original mixing. You might consider throwing a few raw shrimp into the BBQ wok while cooking the vegetables or you could buy two woks and cook shrimp, scallops, pieces of fish or some chunks of chicken breasts separately while the veggies are grilling. I haven't tried small pieces of steak yet, but I believe they would be outstanding. Remember to treat your BBQ wok(s) with consideration and respect. No automatic dishwasher or abrasive scrubbers. Just hot water and a little liquid dish soap will work fine. Bon appetite. 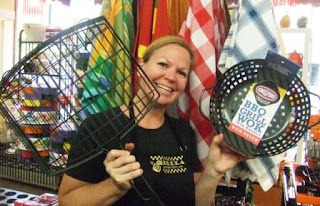 The Grill Basket is one of my favorite pieces, if you love kebabs and you hate trying to turn those little skewers- you will absolutely LOVE this basket!! Line up the kebabs, lock it up and put it on the grill. Turn the entire basket once and voila!! no burned fingers and perfectly grilled kebabs! I've also done steelhead and salmon steaks in the basket. Our favorite grilled vegetable method is to drizzle some olive oil on the vegetables and then add a generous amount of pesto, ground pepper and mix well before grilling. Add shrimp and/or cherry tomatoes towards the end (so you don't overcook the shrimp or tomatoes.